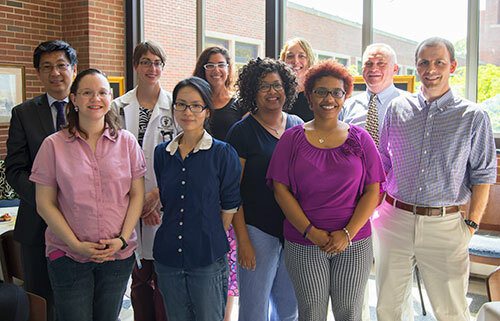 Calling it one of the largest cohorts of promoted faculty in the Purdue University College of Veterinary Medicine's history, Dean Willie Reed recognized ten faculty members at the annual PVM Promotions Reception Tuesday, May 16, in the Continuum Café. "This is a momentous day when we celebrate an important accomplishment for ten members of our faculty," Dean Reed said as he began the ceremony. "For a college with about 115 faculty, having ten promoted in a given year is a large amount and we are very happy about that." Dean Reed also took a few minutes during the reception to explain the background behind the College's tradition of providing caricature drawings to all promoted faculty. "I don't know of another veterinary college in the country that does anything like this, where we give faculty who are promoted a memento that hopefully will be very meaningful," Dean Reed said. Reviewing the tradition's history, Dean Reed said it began with the director of the College's original Medical Illustration Department, Al Allen. At the time, the department housed a team that included medical artists and medical photographers. Early on the drawings were colored pencil sketches created by Allen that looked like something a cartoonist might develop. "In the 1970s when David Williams arrived, Al Allen transferred that responsibility to him," Dean Reed said. "This has been over 45 years — it's been a long tradition of our College and something that I hold in high regard and something that I hope we don't stop doing. It's very important for Purdue Veterinary Medicine." Following the brief program, reception attendees had the opportunity to congratulate each of the honorees and view the caricatures. Congratulations to all of the 2017 promoted PVM faculty members! As part of a feature series, the Vet Gazette will continue its Faculty Spotlight during the summer, highlighting each of the faculty members who received promotions this year. 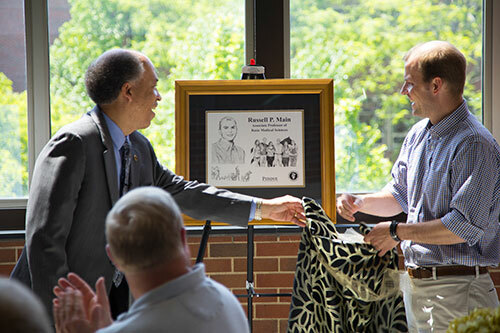 Dean Willie Reed and Dr. Russell Main unveil the caricature created by Professor of Medical Illustration David Williams commemorating Dr. Main's promotion to associate professor of basic medical sciences at the annual PVM Faculty Promotions Reception in the Continuum Café Tuesday, May 16. 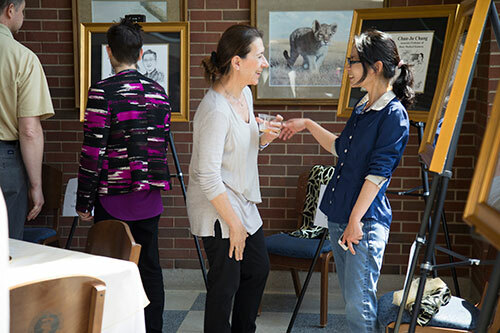 Professor Ourania Andrisani chats with fellow Basic Medical Sciences Department faculty member Chun Ju Chang, who was honored at the reception in celebration of her promotion to associate professor. Congratulations to the 2017 cohort of promoted faculty: (front row, left — right) Dr. Marxa Figueiredo, associate professor of basic medical sciences; Dr. Chun Ju Chang, associate professor of basic medical sciences; Dr. Yava Jones-Hall, associate professor of veterinary pathology; (middle row, left — right) Dr. Hock Gan Heng, clinical professor of diagnostic imaging; Dr. Candace Croney, professor of animal behavior and well-being; Dr. Russell Main, associate professor of basic medical sciences; (back row, left — right) Dr. Stephanie Thomovsky, clinical associate professor of neurology; Dr. Stacy Tinkler, clinical associate professor of equine community practice; Dr. Sandy Taylor, associate professor of large animal internal medicine; and Dr. Nickie Baird, professor of large animal surgery.